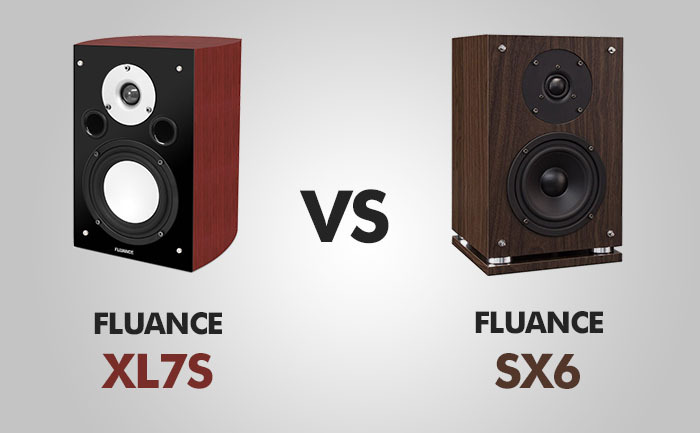 In this review, I’ll talk about two stereo speakers from Fluance: XL7S and SX6. I gathered all the information required for you to make an informed decision whether the 20$ price difference is justified for the more expensive model. Let’s find out. Both models are made of MDF wood, which will reduce resonance and play a distortion-free sound. XL7S comes in three colors: black ash, dark walnut, and mahogany. The SX6 model comes in black, and natural walnut. Both speakers look good and classy and they feel to be worth much more than 150$. They are well built and feel sturdy, so they will hold up for a while. Some people complain that the SX6W model is huge (13.5 inches). I can agree with that if you compare it to computer speakers than they seem rather huge, but as a person raised in 90’s and my first set was Aiwa, I think that there is not much to complain about. But if this is a problem, you can always use 2 inches smaller XL7S. Both speaker models are bookshelf speakers, but with XL7S you have the option to mount them to a wall and use as surround speakers. Although SX6 model is not designed to be wall mounted, if you really want to do it you can use VideoSecu side clamping wall mounts for about 20$ on Amazon. You can also use them as computers speakers, but you will have to connect your computer output to an amplifier and then the amplifier to the speakers. When you first connect the speakers to your amplifier there is a lot of tweaking and not much mid-tones and bass, but after a 10 hour break-in period (as the manufacturer suggests) the sound becomes more alive. You start to hear lower frequencies and highs start to play nicely. Treble: These little neodymium tweeters sound great and it’s completely different league than ordinary speakers. When it comes to quality they will surpass many other loudspeakers for a much higher price. The sound is crisp and clear, but never overwhelming. Mid tones: Mids are clear and nice. One person complained about a bit of hissing in SX6 model. But he also agreed that it can be a different problem and not the speakers’ fault. Anyways he agrees that the hissing is not audible when he starts to listen to music. Bass: These are bookshelf speakers, so I don’t expect much from these speakers when it comes to low frequencies. At first, it was almost undetectable, but after a break-in period, it began to sound great going down to around 33Hz, which is quite astounding for a speaker this size. But remember it’s only a 5-inch woofer so be prepared to push your ears a bit, but don’t expect to move your furniture around. If you decide you need lower tones you can always add a subwoofer later. The XL7S frequency crossover is 6000 Hz compared to 3500 Hz of SX6 model. That means that it can produce a wider range of bass, giving the listener a fuller sound. If you want to take the most out of these speakers, just don’t use mp3 or other compressed formats, they just don’t present the same level of quality as uncompressed files. You may not see the difference between mp3 and lossless formats on your computer speakers, but you will if you listen to the XL7S or SX6 models.